Cache memory, also called CPU memory, is random access memory (RAM) that a computer microprocessor can access more quickly than it can access regular RAM. Thismemory is typically integrated directly with the CPU chip or placed on a separate chip that has a separate bus interconnect with the CPU. Level 1 (L1) cache is extremely fast but relatively small, and is usually embedded in the processor chip (CPU). 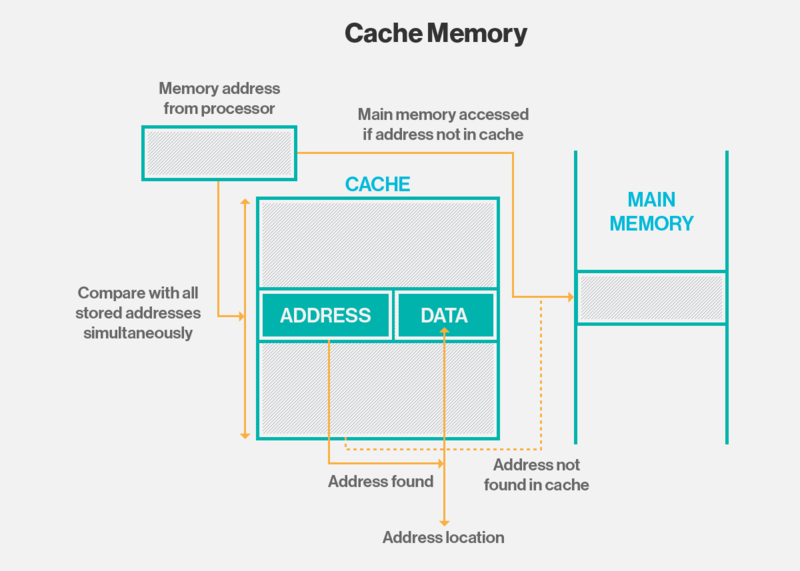 Level 2 (L2) cache is often more capacious than L1; it may be located on the CPU or on a separate chip or coprocessor with a high-speed alternative system bus interconnecting the cache to the CPU, so as not to be slowed by traffic on the main system bus. Level 3 (L3) cache is typically specialized memory that works to improve the performance of L1 and L2. It can be significantly slower than L1 or L2, but is usually double the speed of RAM. In the case of multicore processors, each core may have its own dedicated L1 and L2 cache, but share a common L3 cache. When an instruction is referenced in the L3 cache, it is typically elevated to a higher tier cache.